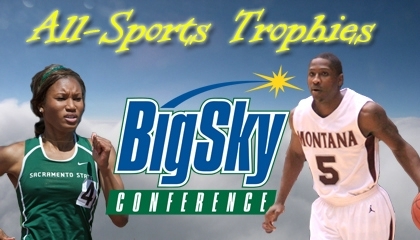 The Montana Grizzlies have won the 2011-2012 Big Sky Conference Men’s All-Sport Trophy with an average of 11.75 points per sport. It’s their first trophy since the 1970-1971 season and their second since the Big Sky Conference started in 1963. 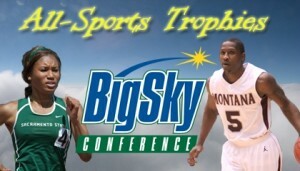 Montana has won the 2011-12 Big Sky Conference Men’s All-Sports Trophy the league office announced Tuesday. It is the first Men’s All-Sports Trophy for the Grizzlies since 1970-71 and just their second since the inauguration of the Big Sky Conference in 1963. Using points from its recent outdoor track and field title, Sacramento State won the Women’s All-Sports Trophy for the fourth time in five years. Montana, which won its first Women’s All-Sports Trophy last year, finished fourth. Montana won the Men’s All-Sports Trophy because of its success in the sports weighted with the most points: football and men’s basketball. The Griz football team shared last fall’s regular-season title. The men’s basketball team won last winter’s championship outright. Montana, which averaged 11.75 points per sport, also won this spring’s men’s tennis championship. The three championships or co-championships were enough to offset a fourth-place cross country finish and seventh-place finishes during both the Big Sky indoor and outdoor championships. Montana State and Weber State tied for second with an average of 11.17 points per sport. Northern Colorado, which had a breakout season for its women’s sports programs with outright titles in volleyball and golf, a shared title in soccer and runner-up finish in basketball, held the lead for the Women’s All-Sports Trophy going into last weekend, but the Hornets’ title combined with the Bears’ last-place finish was enough to earn Sac State the trophy.